XIX. Rally Titles of Excellence. UKC Rally Obedience titles may be earned only in licensed UKC Rally Obedience events. Rally Obedience titles must be earned successively. Equivalent titles from other venues must not be substituted for UKC Rally Obedience titles. A. United Rally Obedience 1 (URO1). This title must be earned from the A or B divisions of the Rally Obedience 1 class or any combination of the two. To earn this title, a dog must: 1. Earn three qualifying scores at three different UKC licensed Rally Obedience trials; 2. A qualifying score requires the successful completion of all obstacles and a score of 70 points or more; and *3. There is no restriction on the number of qualifying scores that may be earned under the same Judge. *3. There is no restriction on the number of qualifying scores that may be earned under the same Judge. D. United Rally Obedience Champion title. (UROC). 1. Eligibility. Accumulation of points toward the title of United Rally Obedience Champion (UROC) title begins at the next trial following the completion of the requirements of URO3 title. Scores obtained in the Rally Obedience 2 class at the same trial at which a dog obtained its third qualifying score towards the URO3 title, and vice-versa must not be used toward the accumulation of UROC points. c. At least 20 points must be earned in the URO3-B class. d. The remaining points may be earned from either class. e. There is no restriction on the number of scores or Rally Obedience championship points that may be earned under the same Judge. *E. United Rally Obedience Excellent (URX). 1. Eligibility. A dog must earn the United Rally Obedience 3 title (URO3) before it is eligible to earn legs toward the United Rally Obedience Excellent titles. There is no limit to the number of Excellent title levels a dog can achieve. a. Combined wins. At ten (10) different UKC Licensed Rally obedience trials, earn a qualifying score in each of the Rally obedience 2-B and Rally obedience 3-B classes in the same trial. 2) The successful completion of all obstacles. b. Advanced Excellent Titles. For every consecutive set of ten (10) combined wins the dog achieves, a numerical designation will be added to the dogs URX title on record. For example URX1, URX2. 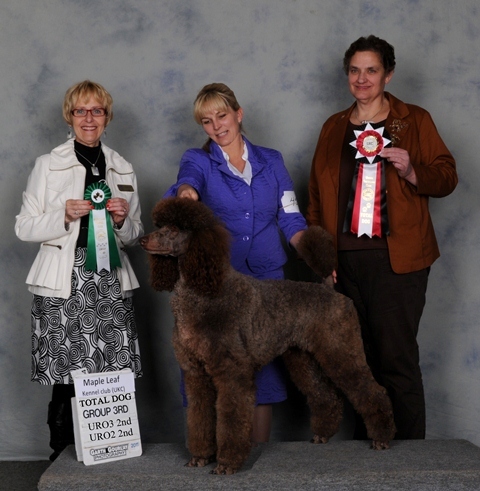 *F. United Rally Obedience Grand Champion. (UROG). 1. Eligibility. A dog must earn the United Rally Obedience Champion title (UROC) before it is eligible to earn legs toward the United Rally Obedience Grand Champion title.